When the King is taken prisoner by Tartarath, the “Dark Master,” twins Prince Aram and Princess Mara, set out to rescue their father and save the kingdom. 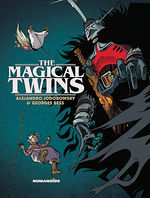 But when the use of magic is forbidden, the twins will have to find new ways to prove themselves worthy of restoring the throne. For ages 13+. 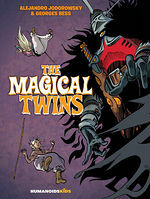 Overall, a great coming of age tale, that proves comics can tell stories for all ages. The story by Jodorowsky is exciting, fast paced, and abbreviated enough for the target audience. The art by Bess is luminous. Altogether, a trip most young reader will enjoy. 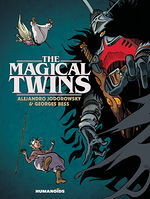 "Younger readers who want a simple fantasy will find it very enjoyable"
"With its positive spiritual vision and Jodorowskian playfulness-in-the-face-of-death, The Magical Twins is a book to be enjoyed and learned from by readers of all ages." "It is a fantastical, magical world we are plunged into, a ‘Once Upon A Time’ world that is beautifully ageless and, I dare say, will stand the passing of time."